This is branded with the Battle for the Cowl banner but aside from being set in current Gotham City, it so far has little to do with the current Bat-books storyline. Which is fine by me, as I can't recall Barbara Gordon having a book to herself since a Batgirl special, just before the Crisis, so I'm more than happy to have her to myself for a while. 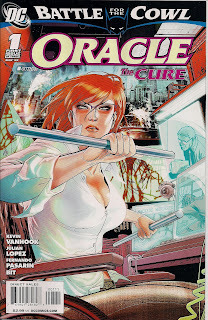 The story picks up after the recent (unconvincing) disbanding of Barbara's Birds of Prey operation, with Oracle setting up a new home and spending time with her father. Commissioner Gordon is splendid here, the 24/7 cop who still makes time for his daughter. And while he sees she has something on her mind, he respects her enough not to press the issue. Barbara, meanwhile, is distracted by supposedly phantom pains in her paralysed legs, having apparently forgotten the BoP story in which an encounter with Brainiac left her with tingly toes - who knows, maybe she's getting more feeling back? I hope not, as she's been far more interesting as the DCU's greatest computer whiz than she ever was as a minor member of the Batman Family - and at the moment there are so many floating around Gotham that a returned Babsgirl would be just another face in the cowls. Also back in Gotham is Barbar's baddie counterpart, the Calculator, seeking the remnants of Darkseid's Anti-Life Equation to restore his bitten-by-a-hell-hound daughter Wendy. From the terrific opening page - a Rear Window-style snapshot of Babs' new building - to the terrible cliffhanger, writer Kevin Vanhook does everything right. He reintroduces old friends, adds some new ones (the Brenda Morgenstern-like Cheese-fiend is great fun), sets up the story, mixes and stands well back. Despite my being tired of the Calculator after his dozens of appearances over the last few years, Vanhook makes him fresh again, adding a layer of real menace to the man. One thing I particularly enjoyed was Vanhook's proving that the omniscient narrator is alive and well - apart from some Oracle thought boxes at the start (would actual bubbles have killed you, DC? ), this is a one-voice book. That's refreshing, these days. The art, by pencillers Julian Lopez & Fernando Pasarin and inkers Bit & David Bryant, is gorgeous. I'm not sure how the art teams were split, but the whole book looks splendid. And whoever drew the moody Gotham night scenes - I'm guessing Lopez and Bit - should be snapped up by the Bat-books for a decent run. Barbara looks wonderful throughout, look at this cute expression, for instance. Mind, the same page has a terribly prurient scene of Barbara preparing for a shower - really, I don't think the world needs to see Oracle's knickers. That apart, this is a first-rate effort; once Birds of Prey returns, as it surely must, I'd love to see the creative team here continue Barbara Gordon's story. Is the "Wendy" you speak of the same as the one whose brother was eaten by Wonderdog on TEEN TITANS?